I wrote this article in 2003 for AmericanJeepers.com. That site is long gone, but I still get asked questions about this swap frequently. The axle I built this on is has been sold for a while, but this swap was of the best mods I ever did to my YJ. I recommend it for anyone that is planning on keeping a dana 30 for any period of time.This article is YJ specific because I have first hand knowledge of this install on aYJ. While there is a lot of documentation on this swap online, I found much of it to be false or inexperienced. Therefore, I will not rely on that info to relate this swap to TJ’s and XJ’s. Please feel free to contact me with questions and I will help to the best of my ability if you attempt this swap on any other Jeep model. Warning! 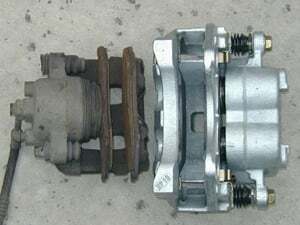 – Modifying your steering and brakes is very dangerous. Neither JcrOffroad nor I, take any responsibilty to person or property you damage because of information in this document. This article is a mearly a guide, if you don’t posses the mechanical skills needed to do these kinds of mods, please find someone that does to assist you. With lifts up to 4” many steering issues (such as bump steer, poor road feedback, etc…) can usually be solved with the installation of a drop pitman arm. When it comes to steering your main goal is to minimize the angle of the drag link relative to the ground. The steeper this angle the more your steering wheel has to turn to compensate for the drag link length as your suspension compresses and unloads. With a mild lift a drop pitman arm will put this angle near stock. Your next goal would be to match the angle of the drag link and the angle of thetrac bar as equal as possible, if you still have one installed. This keeps the drag link and trac bar from fighting each other because of unequal length as your suspension compresses. Your lift kit traction bar brackets should hopefully take care of this issue. On lifts above 4”, even with a drop pitman arm, the angle of the drag link becomes too severe. There are a few kits online to correct this. Some include a high steer arm that you bolt to your passenger steering knuckle, others include a whole new knuckle, and one company takes a stock knuckle and welds on a high steer arm. I do not recommend the latter, search Google on “Welding Cast” and you probably won’t either.While those kits do address the issue of a severe drag link angle by raising the attachment point for the drag link, they don’t address the factory brakes. You’re lifting your Jeep to run bigger rubber and you’re going to drive it on the road with the brakes designed for 29” tires?! Another con of the other setups is cost; because of demand and rarity they can be rather expensive. But don’t fret! Take your WJ knuckles and ¼” hub spacers to a reputable welder to be welded. You may want to bolt a hub on them to assure proper alignment. Support the axle on jack stands and remove the front wheels. Either use an impact, or have someone press on the brakes while you use a breaker bar to loosen them. Remove the brake hose from the calipers. If they are stubborn use a slide hammer to remove them. Another method is to thread the bolts out a few threads, put a junk 13mm socket over them, and hit the socket with a hammer alternating bolt heads hammer down on the flat part at the top of the knuckle. I would replace the bolts after using this method. Remove the tie rod end castle nut cotter pins, and then remove the nuts. Remove the TRE’s by using a pickle fork, or by tapping on the side of the knuckle arm till they fall out. Remove the upper and lower ball joint castle nut cotter pins, and then remove the nuts. Remove the knuckle by using a pickle fork, or if your replacing the ball joints hammer down on the knuckle. Replace ball joints if necessary. Be sure and use new cotter pins on the castle nuts. 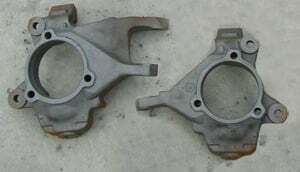 Replace the axle shaft u-joints, if necessary, and install the shafts into the housing. Apply some threadlocker to the threads. Install the stock YJ hubs and hub nuts. I always use antiseize on the hub flange and on the axle shaft splines, this makes the assembly easy to remove next time. Use your stock YJ rotor as a template and drill the WJ rotor to the 4 on 4.5” bolt pattern using a 1/2” drill bit. If you don’t have a drill press, or aren’t comfortable doing this 100% accurately ask your local machine shop to do it for you. Make four 1 ¼” x ¼” spacers with your hole saw. Drill a ½” hole in the center. These will space the calipers out to meet the newly spaced out hubs. Install the new pads into the calipers. Bolt the calipers to the brackets. Bolt the rubber brake hoses to the new calipers. Because of the design of the WJ calipers you will lose a little of your brake line length. You may or may not need longer brake lines at this time. Install the wheels and check caliper clearance. Depending on wheel size, style, and backspacing you may need to grind a little of the WJ caliper. PROCEED WITH CAUTION. There isn’t A LOT of metal there to safely grind. The old style WJ calipers are slightly smaller than the new ones, you may need to purchase a set of those if light grinding on the new style doesn’t solve the contact issue. In EXTREME cases you may need to purchase new wheels to clear. I had no issues with my 15×10” American Eagle 054’s with 3 5/8” backspacing. No grinding was needed. You can also purchase threaded inserts that you weld into DOM tubing. I would use this option if you don’t want to drill and tap your own DOM.